He said the “L” word. Hope you enjoyed this week. Let’s just hope that Alex understands that he can’t just follow his heart- he’s gotta’ lead it if he wants to love her the way she deserves to be loved. Oh my gosh! You quoted one of my favorite songs (from one of my favorite movies)! It’s so true, too! That is excellent! Btw, Scott, TOTALLY LOVE the comic! Can’t wait for the movie! I am going to buy the comics for my kids for Christmas! Thanks for making this! Keep us the fanastic work! Ah, Dan, you are wise beyond your years. Either that or Alex is as thick as a post. Agree! Agree! Agree! Agree! Agree! Agree! Agree! Agree! Agree! Agree! Seriously guys, get voting! Dreamland Chronicles is being beat by The Noob, which has been updated ONCE in the last month. Really, I know we have way more loyal fans than that comic does, and I know that Scott sure does a crazy better job about keeping us updated on his comic, and he’s got a wife and two kids that he seems to be doing an awesome job taking care of and spending time with, on top of catering to our entertainment deprived minds. So, get on to http://topwebcomics.com/vote/4274/default.aspx, do I like I did and save it into your favorites bar in Chrome (or Firefox or IE if you use those) and make it a point, along with your website visit to here everyday (cause I know this site is in your favorite’s bar, too) and vote! Dreamland has less votes than “The Noob”? Oh, come on! Remember election day motto in Chicago: Vote early, vote often! A WEEK ago!? You should be voting on TWC every day. Can’t find the bloody button… So I go to the topwebcomics list, and vote directly from there. Hmm, “I care about someone else” – makes him sound like he never cared about Dan. Kind of a strange and awkward thing to say. The situation seems to be planned well, too. It’s not like a fairy tale, where the hero has about half an hour’s time to interact with the heroine, and then they “live happily ever after”, or a lot of novels where the characters just click and their personalities never clash. It makes it feel a lot more realistic. Yeah, I understand what Alex is saying, but if I were Dan I’d be going “butbutbut what about caring about MEEEEEEEEEEE” inside my head. I was totally thinking that too. Sorry, bro. I don’t like you lol. I remember the ad that originally got me to this site had that line in it. (And I do not mean Sven with that, but anyone who has not seen it! ah. It did seem to obvious to not have been used at all. Coincidentally I just noticed his shirt says “I’m with stupid”. Then again, that’d be the kind of thing someone who was sceptical of Dreamland would say, but… yeaaahh. That’s what I would say to him anyway, no matter how real Dreamland is. Ghaaaaar Dark Materials’ ending is soooo tragic stuff! Nearly cried when it happened, you can only rage like hell at the monstrous “unfairness” of it all! But hey, Alex is supposed (in theory) to become the king of dreamland… Would be Kinda stupid if he couldn’t be there to actually do the ruling! Besides, it would be kindof a blow to every fan if something like that happened, innit? very nice, cant wait to see mondays page. Hes finally getting it. Now jets just hope that he can love her the way she deserves to be loved. AWWWWWWWW!!!! This whole Alex grows up storyline has been really great… I love it. So sweet. What a great way to end the week!! And I don’t think it’s that he doesn’t love his brother or his family, it’s just they’ve probably never come first in his mind. He’s probably always put his own needs/ wants first. Now he realizes that Nastajia’s happiness is more important than his own. And yay!! montage! It’ll be nice to see the whole thing. 😀 Thanks Scott!! Very well put, Christine. Familial love, especially between siblings, doesn’t preclude being self-centered, and bears a striking lack of similarity to romantic love. ooohhh it just turned to daytime in the time i was writing my comment wow what a quick sunrise they have in dreamland! Love is definitely one of the most powerful forces in the universe; look at Anakin and Padme, look at Farrah Fawcet and Ryan O’Neal. It can turn cowards into heroes, the weak into the strong, the timid into the brave. Daniel has the best shirts ever. I want to have a collection of witty T-shirts like his! Considering how he and Dan were usually quick to fight and put each other down, I say the love between them is kind of because they have to, being twin brothers, kind of like me and my brother. Nastajia is the first person that he chooses to love, and perhaps after being shoved down a few more rock faces (one of the funniest pages EVER!) he’ll understand just how to act upon it. I can’t *wait* for the montage! I caught the repeat of the last Livestream, being in class at the time, and I hurt myself laughing so hard at all the images, especially Nastajia and Felicity. Fellow Dreamers, I totally encourge you to check it out! 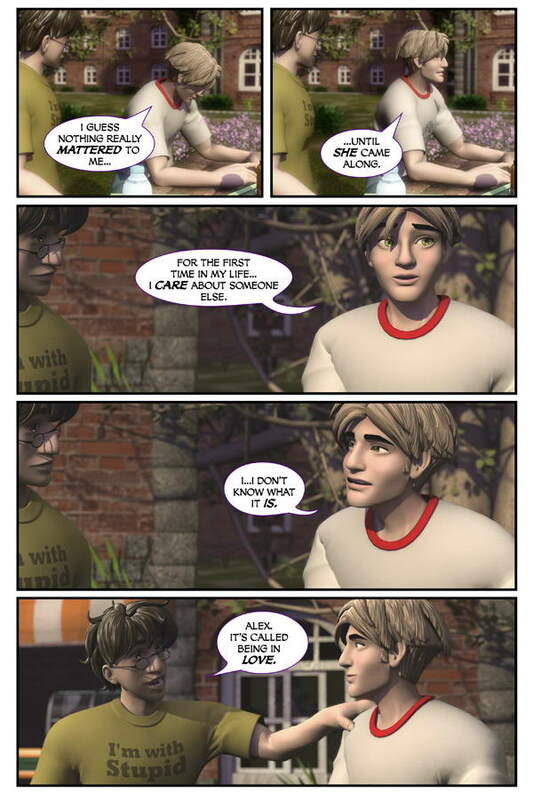 haha I love how on the last panel his, “I’m with stupid” shirt shows when he tells Alex he’s in love. Have a great weekend, Scott. Great character interaction and metamorphosis, this week. Looking forward to the montage! sorry for stupid question… but what’s a montage? It’s a way to show a few days or weeks of events in just a series of clips. Like this. I’ll be doing that next week. As Alex trains and Felicity gets better. Great way to end the week Scott. SO glad you enjoyed today’s page! Man, how would Alex explain that to other, real life girls? That’s because the Fonz was all about cool, and love is the opposite of cool–it’s being excited about someone, hot for them, in every sense. For Fonz to be in love, he would have to give up being the Fonz! Don’t forget, he got to jump the shark, thereby coining a phrase for something in the last stages of artistic exhaustion. EVERYONE IS STRONG AND AWESOME!!! Though the Fonz would just punch Alex in the head, say “Ehhhhhhhhhhhhh…” and Alex would be a super brave genius that would defeat Nicodemus with a macguyvered tomahawk missile made out of centaur bones, Nastajia’s bra, and paddington droppings (they’re depleted uranium, you know, that’s why he disappears for ages, he has to go to the great latrines of his ancestors else he irradiate the countryside) in the next comic. No longer dangerously radioactive, aye. Still some unavoidable trace radiation, I think? But yeah, ‘Mostly Harmless’. Granted, but then again just about everything (especially amongst heavier metals, whether they are inherently radioactive or not) has some trace radiation. I ask yet again: what happens to the Dreamlanders when they sleep? They go to West Hollywood. Can’t wait to see the montage. it was awesome to watch the work in progress. Only problem with falling in love – unless there is a way for him to permanently cross over, he gets to spend no more than eight hours a day with the love of his life. I wonder how he’s going to deal with that once it dawns on him? Don’t forget he’s got the sword that indicates he’s in line to become Dreamland’s High King, or something like that. There may be hope that, before it’s all over, he’ll get a permanent residency. OK, being in love is caring for someone else (even caring more about them than for yourself). But Alex said that it was only when he found a romantic interest that he started caring about anyone but himself and that makes him more of an antihero than a true hero. Personally, I found the idea of a “hero” who holds nothing but apathy (with the exception of close friends and family) to be worse than pathetic. In contrast, true care for fellow human beings goes far beyond love. Yes, there is plenty of room for Alex’s character to develop further. But I was hoping to already see some hint of a hero who’s compassion, steely determination and bravery could one day evolve enough to inspire nations and armies to great deeds. At the risk of sounding harsh, so far all I see is a bumbling (if lovable) idiot who often has his heart in the right place… and not much more. On further thought, I suppose my comment was rather harsh. And Alex always did care about his brother and does show compassion. But then Alex’s own confession of not caring seems to contradict that. I guess I was just hoping for a little bit of hero stereotype to develop by now.